Vola Trades: an OTC trade separately agreed to by both parties and approved by Eurex. This trade requires you to perform an options trade and hedge it with a futures trade. Exchange for Physical: an OTC trade which exchanges an OTC derivative product for an exchange-traded derivative. Exchange for Swap: a strategy where the position in the underlying is traded for a futures position. Cross Trades: occur when a user buys and sells the same contract simultaneously. Cross trades are not processed as OTC trades at Eurex, but are submitted using the Wholesale Order window. The fields in the Wholesale Order window vary depending on the type of product or strategy you trade. If the product is a strategy, the associated legs for that strategy are listed in the appropriate fields in Wholesale Order window. However, leg prices will not be displayed for Eurex spreads and strategies. Open the contract you wish to trade in a Market Grid window. 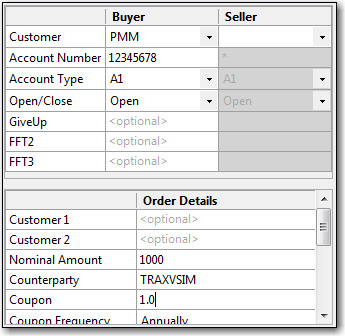 In the Market Grid, right-click the row containing the contract and select Wholesale Orders from the context menu. 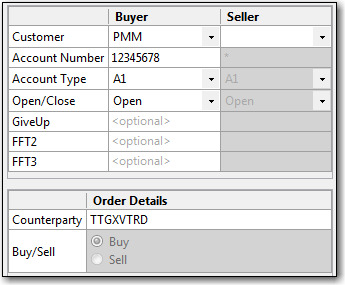 Verify that an order type is selected in the Order Types pane and set the quantity and price for the Wholesale trade. The table below lists the common fields for submitting wholesale trades on Eurex. Sets the Customer Account Number. Sets the account type for submitting the trade. If set to Giveup (e.g., G2), the you must populate the Giveup field with the take-up member ID. Sets exchange counterparty ID for the other party of the trade. Eurex requires the entire 11 character MGT (member group trader) to be entered in the Counterparty field of the Wholesale window. Sets exchange member ID of the Giveup firm. This field is mandatory when Account Type equals G2. To submit Vola trades, you must first complete the fields listed in Common Wholesale Trade Fields for Eurex. In addition, you must complete the Order Details section as listed below. The transaction number of the corresponding options trade. The underlying Options product name (ex. OESX). Entered In conjunction with the Options Transaction ID. The quantity of the corresponding options trade. Sets your side of the trade: Buy or Sell. To submit Exchange for Physical (EFP) Index trades, you must first complete the fields listed in Common Wholesale Trade Fields for Eurex. In addition, you must complete the Order Details section as listed below. Sets the settlement institution for the trade. This value must be provided for both the Buy and Sell sides of the trade. Set the unique, 12 alphanumeric value used to identify the equity cash basket linked to the transaction. Note: The first two characters of the Reference ID must be letters. Sets the equivalent value of the futures leg to be traded. This value must be represented in units of one thousand. To submit Exchange for Physical Fixed Income trades, you must first complete the fields listed in Common Wholesale Trade Fields for Eurex. In addition, you must complete the Order Details section as listed below. The date by which the buyer must pay for the securities delivered by the seller. CouponThe interest rate of the fixed income instrument. The number of interest payments per year. Select one of the following: Annually, Semi Annually, Quarterly, Monthly. The date that the fixed income instrument matures. The entity responsible for the obligation of the issue (optional field). The price of the fixed income instrument. The currency of the instrument being traded (optional field). Select your side of the trade: Buy or Sell. When you are notified by the counterparty that they have submitted a wholesale EFP Index or EFP Fixed Income buy order, you can submit the corresponding sell order and accept the trade in the X_TRADER Orders and Fills Window or Order Book. As part of submitting the sell side of an EFP order and accepting the trade, you must select the Settlement Institution (SI) responsible for clearing the transaction. Right click in the Order Pane and select Inquire Block & Vola Orders from the context window. The Inquire Block and Vola Order window appears. Note: If you are sharing an order book with a user submitting an EFP buy order, the buy order will appear in the Order Pane. To inquire the exchange for the sell order, select the buy order and right-click to open Inquire Block & Vola Orders or click the Inquire button on the Order Toolbar. The buy order's SI value is populated in the Accept button list box while the button is disabled. Enter the order number provided to you by the counterparty, select a TT Gateway, and click Inquire. The corresponding EFP sell order appears in the Order Pane. Only the Order Number and Exchange (Exchange-flavor TT Gateway) fields are required. The TT Gateway you’re logged in to will ignore the Restriction and Product Type fields. Select the sell order and click the dropdown list next to the Accept button on the Order Toolbar. To submit EFS trades, you must first complete the fields listed in Common Wholesale Trade Fields for Eurex. In addition, you must complete the Order Details section as listed below. This field is mandatory for the buyer and displays only for the seller. The settlement date of the swap trade has to be entered. The value has to be greater than the current business date. This field is optional for the buyer and displays only for the seller. The identification of the first customer involved in the EFS swap trade has to be entered. This field is optional for the buyer and displays only for the seller. The identification of the second customer involved in the EFS swap trade has to be entered. Coupon The interest rate of the fixed income instrument. This field is mandatory for the buyer and displays only for the seller. The fixed leg coupon frequency of the swap has to be entered. Enter the number of interest payments per year by selecting one of the following: Annually, Semi Annually, Quarterly, Monthly. This field is optional for the buyer and displays only for the seller. The variable rate reference can be up to 12 characters. This field is optional for the buyer and displays only for the seller. Enter a numeric variable rate offset value greater than or equal to -99.9999 and less than or equal to 99.9999. The currency (EUR, CHF) of the instrument being traded. To inquire about a OTC trade using either X_TRADER or the Eurex exchange GUI, you will need to enter the product name and Eurex's Trade Entry Service (TES) Trade ID (TESTrdID). The TES Trade ID number is generated by Eurex when a OTC trade is submitted to a counterparty via the Wholesale Order window in X_TRADER or a Trade Entry Service window in the Eurex GUI. To inquire on a Block trade that you submitted using X_TRADER, click on the Block trade in the Order Book and click the Inquire button in the Order Pane to submit the other side of the trade. 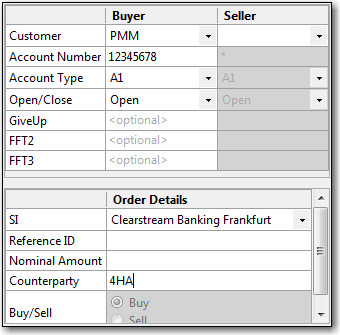 In the Order Book, the Order Number column displays a concatenation of the product name and Trade ID (e.g., FDAX:801) for a Block trade. To inquire on a Block trade that a counterparty submitted using X_TRADER, right-click in the Order Book and select Inquire Block & Vola Orders. In the Order Number field on the Inquire Block and Vola Orders screen, enter the product name and TES Trade ID provided to you by the counterparty. Enter the Order Number in the format "Product:Trade ID" (e.g., FDAX:801) and click Inquire. 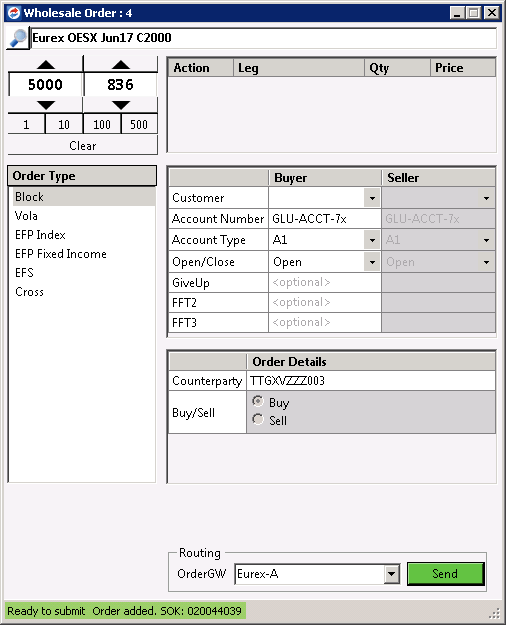 When providing the Order Number to a counterparty who is using the Eurex GUI to inquire on a Block trade that you submitted via X_TRADER, instruct them to enter the product portion of the Order Number in the Eurex GUI Product field (e.g., FDAX), and enter the Trade ID portion of the Order Number in the Eurex GUI TESTrdID field (e.g., 801). When receiving product and Trade ID information from a buy-side user who submitted a Block trade using the Eurex GUI, ask the user for the Product name (e.g., FDAX) in the Product field, and the Trade ID in the TESTrdID field on the Eurex GUI. These fields are located in the upper left corner of the GUI. The GUI field names appear in these fields prior to submitting the Block trade. After clicking Apply, the fields are populated with the product name (e.g., FDAX) and Trade ID (e.g., 806), respectively. To inquire on a Block trade that a counterparty submitted using X_TRADER, right-click in the Order Book and select Inquire Block & Vola Orders. In the Order Number field on the Inquire Block and Vola Orders screen, enter the product name and Trade ID provided to you by the counterparty. Enter the Order Number in the format "Product:Trade ID" (e.g., FDAX:806) and click Inquire. Volatility trades consists of a Block order for an options contract and a Vola order for the related futures contract. The Block order is submitted first using the Wholesale Order window. After submitting the block order for the call or put options contract in X_TRADER, the Order Number column in the Order Book and Audit Trail display a concatenation of the product name and TES Trade ID (e.g., OESX:15). Give the order number to the counterparty so that they can inquire and accept the transaction. If the counterparty is using X_TRADER, the user can inquire on the order by right-clicking in the Order Book and selecting Inquire Block & Vola Orders to enter the order number for the options contract. 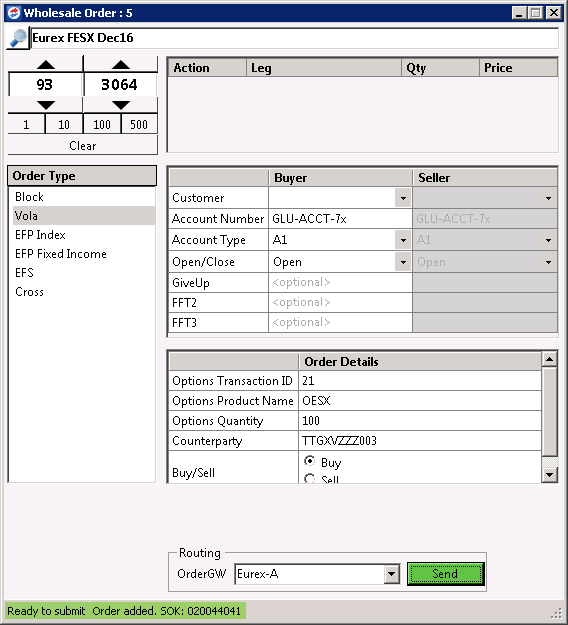 When providing the order number to a counterparty who is using the Eurex GUI, instruct the user to enter the product portion of the order number (e.g., OESX) in the Eurex GUI Product field, and enter the TES Trade ID portion of the Order Number (e.g., 15) in the Eurex GUI TESTrdID field. If the initiator and counterparty are both using X_TRADER, you'll both receive fills with a transaction ID in the Audit Trail after the counterparty accepts the order. The transaction ID is displayed in TransID column in the Audit Trail. When you initiate the Vola order for the underlying futures contract (e.g., FESX), enter the Options Transaction ID (e.g., 21) and the Options Product Name (e.g., OESX). Adjust the Options Quantity field as needed. After sending the Vola order to the exchange, give the order number (e.g, FESX:300001) displayed in the Audit Trail to the counterparty, who can inquire and accept the transaction by entering the order number in the Eurex GUI. The counterparty must enter the underlying futures product name in the order number (e.g., FESX) in the Eurex GUI Product field, and enter the Trade ID portion of the Order Number (e.g., 3000001) in the Eurex GUI TESTrdID field. When a Volatility trade is initiated from X_TRADER or other external front-end trading application (e.g., Eurex GUI), you will have to inquire and accept both the Block order for the options contract and the Vola order for the related futures contract. In order to inquire, the initiator must provide you with the order number (X_TRADER) or product symbol and TES Trade ID (Eurex GUI). When receiving product and TES Trade ID information from a buy-side user who submitted a Block trade for the options contract using the Eurex GUI, ask the user for the Product name (e.g., OGBL) in the Product field, and the Trade ID in the TESTrdID field (e.g., 9) on the Eurex GUI. These fields are located in the upper left corner of the Eurex GUI after the buy-side user submits the Block order. To inquire on a Block trade that a counterparty submitted using the Eurex GUI, right-click in the Order Book and select Inquire Block & Vola Orders. In the Order Number field on the Inquire Block and Vola Orders screen, enter the product name and Trade ID provided to you by the counterparty. Enter the Order Number in the format "Product:Trade ID" (e.g., OGBL:9). When you click Accept in the Order Book, you'll receive a fill for the block order and the transaction ID for the fill will be displayed in the Audit Trail. After the order is accepted, the user can initiate the Vola order for the related futures contract. When receiving product and Trade ID information from a buy-side user who submitted a Vola trade for the underlying futures contract using the Eurex GUI, ask the user for the Product name (e.g., FGBL) in the Product field, and the Trade ID in the TESTrdID field (e.g., 36) on the Eurex GUI. These fields are located in the upper left corner of the Eurex GUI after the buy-side user submits the Vola order. To inquire and accept the Vola trade that a counterparty submitted using the Eurex GUI, right-click in the X_TRADER Order Book and select Inquire Block & Vola Orders. On the Inquire Block and Vola Orders screen, enter the product name and Trade ID provided to you by the counterparty in the Order Number field. Enter the Order Number in the format "Product:Trade ID" (e.g., FGBL:36). Accept the order in the Order Book to generate a fill and complete the Volatility trade. 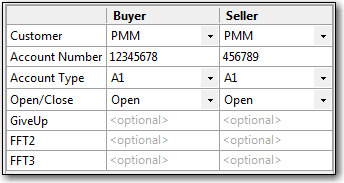 Select Cross in the Order Types pane and set the quantity and price for the trade. Complete the remaining fields for both sides of the trade as listed below. Once the fields are complete, press the Send ITX (Intention to cross) button. Eurex mandates that members send an "Intention to cross" message prior to performing a cross trade. This message is broadcast to all market participants. Users have the ability to always send the ITX automatically prior to cross. Sets the customer account number, firm name, etc., that the trade is being given up to. Sets the customer specific information.